Discussion in 'Safety' started by rochem, Mar 26, 2009. I apologize in advance for the length of this post, but I don't think I can take this anymore. The rigging situation at my school’s theatre has gotten to the point where I am actually nervous about spending too much time under the battens. This can all be traced back to one person – the director at my school. Until last year, our director was also the Technical Director (and pretty much everything else). He’s retired, so he had the time for it. He has no formal theatre experience apart from high school theatre way back a long time ago. Most of what he knows he has taught himself as he’s done this for so long. This year, we have a new TD who did actually do theatre work in college, but isn’t very knowledgeable about lights, sound, or rigging. The main difference is that the new TD is fully aware of his lack of knowledge, while the director insists that he knows exactly what’s going on all the time. I’m just going to list a couple examples of rigging problems at my school, almost all that can be traced back to the director. For one, our system has not had an inspection in at least 19 years (as long as the director has been there), and probably many more than that. Somehow, a lift line has gotten tangled underneath one of our battens, so we can't move either of those battens. Any attempt to move one just makes the other start moving also, and if you go far enough it will start to tip at a very steep angle. Only a couple of our arbors actually have working retaining collars that can lock. Some are just totally missing the collars, and some of the collars can’t tighten so they just move freely up and down the arbor. Even scarier is that many of our arbors have many bricks actually stacked on top of the collars in the arbor. And even scarier than that is that four of our arbors have bricks resting on just one collar, meaning that the entire stack above that is at an angle, and thus much closer to potentially falling out. We have the typical “spreader plates used to mark pipe weight” problem, and the ropes are so old that they literally draw blood even if you only use one lineset that’s perfectly in weight for a couple seconds. And now the big thing that prompted me to write this. During the final rehearsal/first preview, a call came over the radio that one of the linesets had started moving on its own while it was still locked. I sprinted down from the booth to backstage to check what happened, and when I got back I discovered that the adjustment screw had come loose all by itself over the course of an hour without having ever been moved in that time! I know that none of the techs did it, because they had no idea it was even there and they were all pretty scared about it too. I tightened the screw back up and tied off the arbor to the locking rail using safety cables and a carabiner, just in case. Then I sat down there by the rail for the rest of the show to make sure it didn’t move again. The next day, I walk into the theatre to find that the screw had come loose again, and the safety cables were the only thing preventing the pipe and the set piece on it from falling to the floor and crushing scenery. I tightened it again and just left the cables on there. Later, the director came in, saw the cables, and removed them from the arbor without asking me why they were there. He then confronted me about why I had done that. Of course I had already told him what happened, but I told him again and explained why I wanted to have a second method of support in case the screw loosened again. He then gave the answer that made me question whether I really wanted to be in this theatre: "Oh, this happens occasionally. The Second Electric does this all the time too. You just have to tighten it down and it'll stay for a while." At this point, I didn't say anything, just had an expression of disbelief on my face, so he continued, "I'm a jerry rigger. This isn't professional theatre, it's high school, and so we can't always do things the way they do on broadway. Safety's important, but if I need something to get done, I'm just gonna do it the easiest way I can, not make more work for myself to make it safer. We can worry about that another time." Am I just overreacting here or something? To me, I can't even fathom how someone could say that and actually mean it. Maybe I'm just taking this safety thing too far, but I don't think so. Anyways, let me get to the point of all this. I've realized after trying hopelessly for a long time that there's no way I can convince him to start using safer rigging practices. Is there some obscure law somewhere that says "you need to use safe rigging in schools" or something? Basically, anything that I could use to get an inspector to show up for a surprise rigging inspection. Unfortunately, rigging inspections are too expensive for me to afford, and like I said there's no way I can convince this guy to pay for one. I have tried to ignore this stuff for the most part, since you can't win every battle, but now that things are actually starting to drop down by themselves, I can't ignore it anymore. Does anyone have any suggestions as to what I can do? You can try taking it up with the head of the school, or do what i did at a school, and inform the dean along with anyone else that i cannot work there because i dont want to get crushed due to someones incompetence. I tend to get pissed off if i have to go diving after one of my friends to drag them out of the way as a set piece falls due to an idiot rigging it up using s-hooks. Also threaten to get the media involved, especially with all the rigging incidents lately, schools hate bad publicity. It sounds to me like someone needs to give OSHA a call and report the unsafe conditions at this theatre. The theatre will probably get shut down, but better that than a fatal accident. unfortuately OSHA does not govern schools. I know a lot of schools use this as an excuse to following safe practices. If i am out at a school and i see a kid not wearing a safety goggles while grinding or something like that, i tell them that they better get some on quick. Even out at the farm i try to be as safe as possible, especially since there is not a hospital aorund for at least 50 miles, and i really like my arms legs and eyeballs, and perfer to keep them. There is an original topic about this incident, somewhere. It hits close enough to home to get you thinking, doesn't it? unfortuately OSHA does not govern schools. This is not quite accurate. US OSHA covers employees in private industry, so public school employees may not be covered. However, many States have OSHA laws to include public employees. In those case, students are still not covered under OSHA, but the staff - teachers and custodians - are covered. But, as noted, nothing works better than bad publicity. "School Endangers Students". Too bad it's not sweeps month. You dilemma seems to be either to walk away from something you enjoy because it's not safe, or continue to endanger your own health as well by remaining involved. If you're a student, how much time do you have left at that school? If you're staff, etc., I would think it's time to raise the issue outside the school. Your conscience should be your guide. If someone else gets injured and it's something you knew about and possibly could have prevented, how would you feel? Due to the current economy they could just argue no money for repairs and shut the whole theater down. But better that than a flat coming in on an actor. If I were in that position, a hapless highschool student. I'd threaten to alert the media. Take lots of pictures, write a testimony, tell my parents and ask them to talk to school officials. If he doesn't get it fixed, then I would go though with the threat and send all the information to the local paper. They'd love to have a good story like that. In all likelihood the guy would loose his job. Not at all a very nice means to get what is NEEDED, but safety is number one in my books (I've been injured too many times by other people's incompetence and unsafe work environment). Go to the school administration and have this idiot fired...NOW... He is playing a risky game... and has students lives in his hands. There is no small rigging problem, if you were to have a runaway people will die. This "teacher" needs to be fired NOW. You are working in very unsafe conditions. The theater needs to be shut down until you have a trained rigger in there to repair the previous damage. [user]rochem[/user] you are in a terrible position right now. I know you don't want to but you need to go to the administration. If there were a disaster, you have posted the conditions on the internet, and this thread may be found. This showing that you knew the conditions were unsafe, and did nothing to try to fix it. If the administration gives you trouble, myself and possibly every other rigger on this site will back you up. I am deathly afraid that your next post will be that you had a runaway and someone is dead. This situation needs to get fixed now. Safety is ALWAYS the FIRST Priority. If not people will be severely injured and dead. Also show them this picture. Serious damage will happen if this continues, making the conditions even more unsafe. I feel for you Rochem. BUT DO SOMETHING. Do you guys ever have professionals come in for shows? If so and you know a way to contact them about it DO. I talked to one of the guys at our school very frankly about what happened and he talked to some of the teachers. I think he's also checking over the system when he's out here. The other one managed to convince the drama teacher that I do know how to reweight properly (as opposed to leaving stuff out of weight and muscleing it). Still not great, but it is improving. I know this thread is a few days old but I agree with everyone who has said something must be done NOW! Rigging should only be done by qualified people. Designing a new rigging system or modifying a problem system should only be done people qualified to design and/or perform maintenance on rigging systems. Get a theatre rigging specialist in there as soon as possible. If for some reason you do not get any understanding from the first level of administration you talk to keep going up the line. If people do not seem to understand then talk to one of the members on the school's board, assuming your school has one. If still do not have any success see if you can find out the school's primary law firm. Many school districts have one on retainer. If you contact them about the potential liability they will be compelled to contact the school's top adminstrator. Somewhere somebody on this chain should get very scared and do something. By properly notifying each of these people in writing of the problems and potential (very likely serious) consequences makes each assume some responsibility for acting. I too hope this thread is followed up by the action taken instead of some tragic story. Michael, your LIFE is worth far more than high school theater! Your "jerry rigger" teacher has no idea how dangerous his actions are. He's been lucky so far but eventually someone IS going to get killed or badly injured. He's rolling the dice with every show and all that gear is just getting older and older every year. I'm sorry I missed this thread before because I want to help you do something. Here's what I would do... I started to write out a measured respectful response but it's too late for that... so I deleted it. Your quote, if accurate, shows that he doesn't care about doing it the safe way he only cares about getting it done. There is nothing that he can teach you worth learning. If you do the respectful thing and just walk he will just keep going. You need to get out and you should make a big mess on your way out the door. 1) NEVER walk on that stage again. 2) Share all the details you can of with us. We will help you put together a fact sheet of all the dangerous factors and explain them. This will produce a simple sheet you can share with parents and administration. This is probably something to do via PM with a small group of us. Start writing a list of everything you can think of and send it to me. I'll pass it around with some of our pros and we'll work on helping you identify all the dangers and why. 3) Get your parents MAD about the dangerous conditions. Angry parents are POWERFUL forces in schools. What if we had a rigger and safety expert who works at one of the worlds most famous entertainment venues call your parents and explain why your theater teacher is going to kill you if they don't do something about it? I think I can arrange that pretty easily. Then we get your parents to educate more parents. Have them go after the teacher through the school administration. 3) If you get no satisfaction at the school, you then have the angry parent mob bombard the school district's Risk Management department and better yet the State Occupational safety office (NY is not an OSHA state they have their own state plan) with angry phone calls about the unsafe conditions at the school. -You may have to change schools or get involved in community theater instead. -You will know you did the right thing. -I know half a dozen people around CB who would give you a job some day just because you stood up for safety like this. You could let it go and keep working. You could walk away quietly. But how will you feel, if someone dies in two years because of a runaway? The potential personal cost for you is great. I understand that. But it's worth it compared to losing the life of a friend... and let's face it "Mr. Jerry Rigger" isn't teaching you anything worth learning anyway. a question like this came up at USITT this past march in a rigging seminar. the best thing to do it to try and lock off all the arbors so that people won't use them and injure or kill someone. also, contact school officials and/or teachers unions. if a teacher is using the space and it is unsafe, the union will (or should) get behind the safety concern very strongly. just make sure that no one uses that counterweight system until proper action is taken. it only takes one instance and you have serious problems on your hands. Northwestern University - Lighting and Sound Tech. My school's auditorium is not blessed with a fly system (or perhaps cursed), but here's how the rigging takes place- ALL curtians- thats an US and a MS traveler, a grand, valance, 3 teasers, and 3 sets of legs are hung on light duty chain that runs into eyebolts which are screwed into 1X4s wich are somehow attached to a PLASTER ceiling. The legs are on a curtian trac that holds a batten on a swivel joint, which is slightly useless. Last year something moving got caught on a leg, wich one end of promptly ripped out of the plaster. the batten on the track came hurtling twards the ground, and abruptly stopped, putting great stress on the other chain. we quickly removed the track and stored the curtian for a while. Later on "plant services" came in to "fix" it. Their solution?- Wrap the chain aroudn ELECTRICAL CONDUIT running along the ceiling. like 1" conduit. Not even the big stuff. Oh, and the end of the drape hangs about a foot and a half off the deck. Aside from curtians, there are the electrics. There are real battens connected to real ETC raceways, and then, where there is supposed to be another, stock batten on top, they simply looped some aircraft cable through the hole, put two rope CLAMPS on it, and then secured the end with ELECTRICAL tape. I safety all my instruments well, but that does nothing for the rigging, of which the ACC goes up through a hole in the plaster, and is secured around who knows what. Probably the origional wooden beams that support the leaky roof. OH- and more to hang the upstage boarder, they decided it was best to run some light duty chain between the US trav chain and the MS boarder, and then drop the chain, because that's so much easier than running it all the way up to the drywall screws. At another local high school I went in a few years ago has a beautiful auditorium. On stage is a HEMP rigging system, with all the drapes and electrics TIED OFF. on a WOODEN beam a level above the deck. Its been a while since I've been in there, but I'm sure there are many more insane rigging examples I could find. Our newest high school just got a brand spankin new 8 million dollar auditorium. Complete with fly system. And NO ONE. That has a clue about counterweight fly systems. It scares me to death. Even if the rigging is proper, imagine a swinging flat comming down, shearing off an unsaftied S4, which quickly slips out of its stage pin socket and plummets to the floor on a dark, scene changing stage. Ah the horrors of High School rigging and the reason every district Risk Management office should own a copy of Dr. Doom's book. The most likely outcome would be that a lot of theaters get shut down... but if less people get killed or maimed it's worth it. the horror stories i am familiar with are professional theatre or college theatre accidents, but i'm sure it has happened somewhere sometime. If you are talking about some other device, it may be a different story. Use of E-tape is also common practice to whip the ends of wire rope, though I have heard reasons why you shouldn't use it, I have never been told it is wrong. Again, this type of rigging is not wrong or unsafe unless it is used improperly. Hemp fly systems were the long time standard with a wooden pin rail and wooden pins. Why? Because we got a lot of our rigging techniques from sailors, and sailing ships had wooden pin rails with wooden pins for tying off hemp ropes. Lines are tied off or cleated to the pins and sometimes directly to the rail. Even in my theatre which has a full single-purchase couterweight system we still have use for a pin rail. Here you just contradict yourself. If rigging is done properly then the odds of an accident you describe are pretty slim. While it is good to have a safety conscious attitude, thinking of scenarios with near impossible situations is kind of moot. If you are trained or supervised by a trained person and you follow correct practices you will be safe. Fear is a healthy thing in this industry as long as you let it drive you to safe practices rather than letting it stop you from doing anything. Rigging is a dangerous aspect of theatre and should only be done by trained people or under the direct supervision of trained people. It should not be taken lightly and there are some serious issues raised in this thread. However, it is important to be able to recognize what the dangerous situations are and what proper usage is. Yes, they are indeed "Crosbys" (hey, I learned a new term). Some of them are backwards (the whole don't put a saddle on a dead horse reminder), though. For something permanent, I would think it should be crimped. I know hemps are still prevalent, but the safety of one that is probably 60-80 years old, with doubtable inspection? 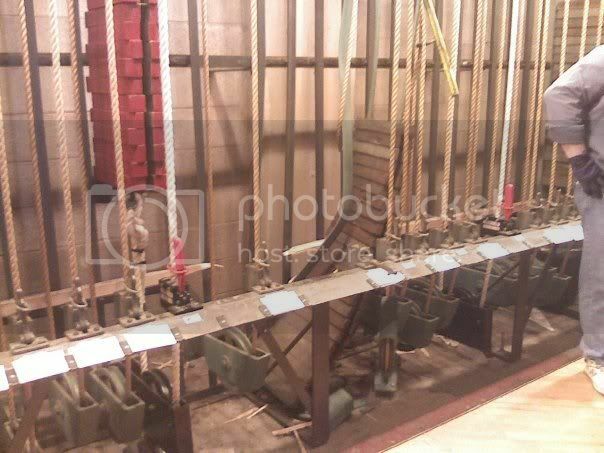 Plus it would take an old school rigger to operate it. Perhaps I am being a little too paranoid though, thanks for your wise words, Icewolf.